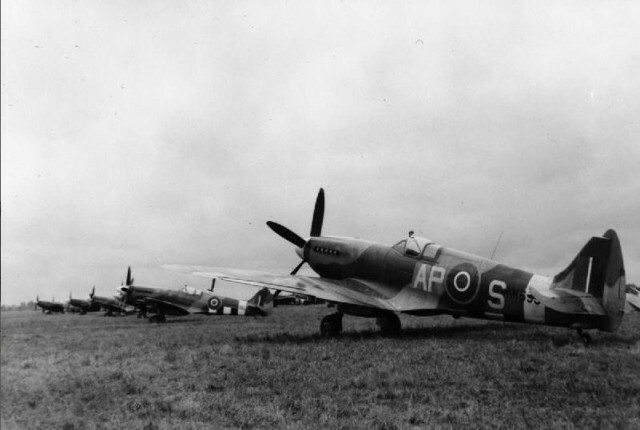 A row of Supermarine Spitfire Mark XIVs (RM693 ‘AP-S’ nearest) of No. 130 Squadron RAF, on the ground at B.82/Grave, Holland. Operating as part of 2 TAF, NO. 130 Squadron received their Griffon-powered Mk. XIVs two months after D-Day. The new type was immediately put to good use in countering the V1 menace then ravaging Britain. September 1944 saw the squadron move to Holland to carry out fighter reconnaissance sweeps and to combat the jet powered Me262, then appearing over the battlefield. Spitfire RM693 subsequently served with No. 41 Squadron RAF and No. 416 Squadron RCAF.